CORVALLIS, Ore. – Encasing insecticides in microscopic plastic capsules – a common formulation for many pest sprays on the market – could lead to unintended consequences, according to a new study from Oregon State University. Environmental toxicologist Stacey Harper and her team found that a common insecticide in its “capsule suspension” formulation – with molecules of the active ingredient encapsulated in tiny, inert plastic pellets – was more toxic than the same amount of active ingredient delivered straight up in water. Their study is published in the journal Nanomaterials. Harper, an associate professor in the College of Agricultural Sciences and the College of Engineering, and her doctoral student Matthew Slattery studied a commercial pyrethroid-type insecticide with an encapsulated active ingredient, gamma-cyhalothrin. The insecticide is primarily used in the home and garden for ants, bed bugs, ticks and other insects. The capsules encasing the product’s active ingredient range from micron-sized (a human hair is 40-75 microns thick), to nanometer-sized, a thousand times smaller. The researchers spun the off-the-shelf product in a centrifuge and sorted its capsules into two size classes. There was a wide range of sizes; most capsules were in the neighborhood of micron-sized, but some were nanometer-sized. 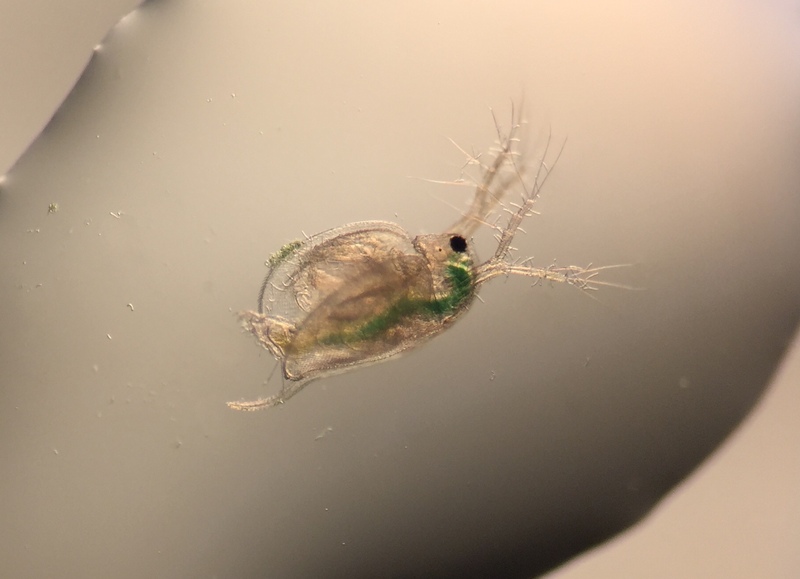 They exposed a species of water flea (Ceriodaphnia dubia) to five doses of the pesticide’s active ingredient. One group got it in micron-sized capsules, and another group got the same dose in nanometer-sized capsules. As a control, a third group got the same dose of active ingredient, but it was not encapsulated. The team found toxicity for the water fleas increased in the nanometer-sized capsules. The crustaceans were immobilized, leading to their death. The species lives in freshwater lakes, ponds and marshes and, due to its sensitivity to pollutants, is used in toxicity testing of waterways. Chemical manufacturers have offered encapsulated formulations of pesticides for more than 50 years, Harper said, because encapsulation is thought to improve the product’s dispersal and durability. Harper, also an environmental engineer, studies the environmental effects of human-made nanoparticles—microscopic bits of matter engineered to have commercially useful properties. Nanoparticles are widely used in pharmaceuticals, pesticides and personal care products, but little is known about their long-term environmental or health effects. The study was co-authored by Bryan Harper, a senior faculty research assistant in the Department of Environmental and Molecular Toxicology. The study was funded by the U.S. Environmental Protection Agency, the U.S. Department of Agriculture’s National Institute of Food and Agriculture and the Agricultural Research Foundation of Oregon.